In the Lutheran Church–Missouri Synod, we live in a liturgical climate of “anything goes.” One can indeed find traditional liturgy in our churches, but one can also find innovations that can hardly seem in any way congruent with our confessional writings, innovations such as: entertainment-based rock music, skits, comedy routines, free-form worship, odd movements and speaking in gibberish, lay “consecration” and “preaching,” infrequent and/or open communion, the setting aside of vestments, the use of props and gimmicks for preaching, polka services, dancing girls, and even services led by clowns in face make-up. In fact, in the Lutheran Church–Missouri Synod, pastors (and lay members of the synod, such as school teachers and other lay offices created to assist the Office of the Holy Ministry) subscribe to the Lutheran confessions (i.e. the Book of Concord) in a “quia” manner, which is to say, in their entirety “because” they are in accordance with Holy Scripture. This is in opposition to the less stringent “quatenus” manner of subscription, which is to say that each statement in the confessions is accepted or rejected individually “insofar” as each is in accordance with Scripture, thus allowing for individual interpretation based on one’s opinion as to whether or not parts of the confessions pass Scriptural muster. Practically speaking, the latter is a clever way of not subscribing to the Book of Concord at all, as C.F.W. 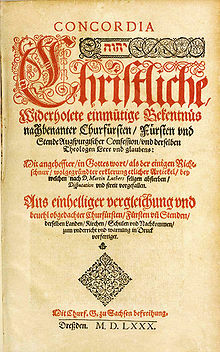 Walther pointed out, a Christian could even subscribe to the Koran in a “quatenus” manner. The latter approach implies that “prescriptive” confessions would be binding, whereas “descriptive” confessions are not binding, but are rather only a historic snapshot of what the church looked like in a specific time or place, but here and now, we are free to accept or reject parts of the Book of Concord we don’t find relevant today. Of course, if that is the case, one’s ordination vows are even weaker than a “quatenus” subscription. Christians can (and do) worship God apart from traditional liturgy. They just aren’t “Augsburg Confession” Christians, which is to say, they aren’t Lutherans. We Lutherans—especially in Lutheran communions which pledge a “quia” subscription—yield to the veracity of the Lutheran confessions as expositions of Holy Scripture. When we say: “In our churches…” or “We believe, teach, and confess…”, we are saying that these are true statements. In short, we are saying these Lutheran confessions are “descriptive.” They “describe” what you will see “in our churches,” both in beliefs confessed and ceremonies and rites practiced. Unfortunately, among the “contemporary worship” set who have scandalously laid aside ceremonies which taught the people about Christ and established evangelical decorum; among the pastors who have traded in their traditional vestments for trendy golf shirts; in those congregations that make use of skits, clowns, dancing girls, and other undignified and frivolous gimmicks which make a mockery of the above-cited passages; as well as in those congregations in which the Mass is willfully not celebrated every Sunday, these statements are not descriptive at all. If our “descriptive” confessions do not “describe” what our churches believe, teach, confess—and indeed practice in ceremonies—then it is time for those congregations and pastors to reconsider their commitments to these confessions. The fact that we have evangelical liberty and the fact that our Book of Concord is descriptive and not prescriptive should not be interpreted as license to overlook it, or even regarding some matters, adopt an opposite confession, at least not while maintaining a subscription to these symbolical and confessional writings. With descriptive confessions, there can be no separation of style and substance. Either “what you see is what you get”, or the Book of Concord is a lie. Note: as a bonus throwback, here is a similar piece from 2013.